Drowsy driving, also often referred to as “fatigued driving,” encompasses a number of driving behaviors that all stem from being too sleepy or tired to be behind the wheel. A driver does not have to completely fall asleep while driving to be considered a drowsy driver. A driver that dozes off for a split second or is so fatigued that he or she cannot pay attention to traffic are also forms of drowsy driving. Precise figures are hard to come by regarding drowsy driving accidents because drivers are reluctant to self-report falling asleep or nodding off behind the wheel – particularly if it resulted in a collision. However, according to the Texas Department of Transportation, fatigued driving was a factor in 4,183 collisions in 2011. Of those accidents, 136 were fatal, 1,178 caused serious injuries and another 711 resulted in less serious injuries. State reporting practices are inconsistent, but the National Highway Traffic Safety Administration (NHTSA) estimates that, nationwide, over 100,000 crashes each year are caused by drowsy drivers. Those collisions are estimated to result in the loss of 1,550 lives and cause 71,000 injuries. Some experts have compared the dangers of drowsy driving to those associated with drunk driving. The results of a recent Australian study support that comparison. In that study, researchers found that being awake for 18 hours straight created an impairment level equal to a blood-alcohol level of 0.05 percent, and staying awake for 24 hours was the equivalent of a blood-alcohol level of 0.10 – over the legal limit in Texas. What makes it an even bigger concern is the prevalence of fatigued driving. A poll conducted by the National Sleep Foundation found that 60 percent of those surveyed admitted to having driven while feeling drowsy within the past year. Moreover, 1 in 3 of those polled said that they had actually fallen asleep while driving in the past year, with 13 percent admitting that they fall asleep behind the wheel at least once a month. Along with accidents that are a direct result of a driver falling asleep behind the wheel, other bad driving behaviors are also associated with fatigued driving. For example, experts see a correlation between drowsy driving and aggressive driving, meaning that the more fatigued a driver is, the more likely it is that he or she will drive aggressively. Driver aggression or “road rage” also contributes to crashes. Use of drugs or alcohol. This includes over-the-counter medications and prescription drugs, as well as illegal drugs and alcohol. Driving long stretches of rural roads, particularly at night. Failing to take breaks while driving. Experts recommend stopping every two hours or every 100 miles when on a long road trip. Not sharing driving responsibilities. If you are traveling with another person who can drive, you should switch off whenever you take a break. One reason that drowsy driving accidents continue to grow in number is that people fail to recognize the signs of fatigue. 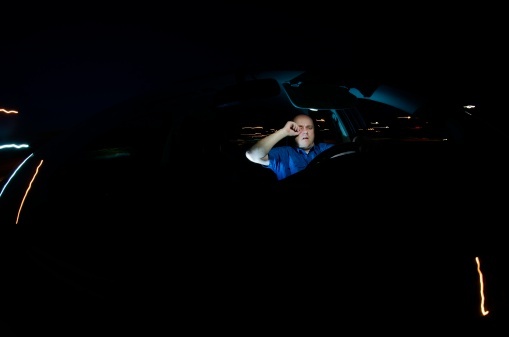 Drivers often feel that they will know when they are too tired to keep driving. This belief causes them to keep pushing on for those few extra miles before stopping —often with deadly consequences. Difficulty focusing, frequent blinking or heavy eyelids. Daydreaming, wandering or disconnected thoughts. Trouble remembering the last few miles driven, missing exits or traffic signs. Yawning repeatedly or rubbing your eyes. Drifting from your lane, tailgating or hitting a shoulder rumble strip. Unfortunately, too many drivers ignore the warning signs and fail to get off the road even when they are too tired to drive safely. These careless motorists put themselves and others at risk of serious injuries in a car crash. If you have been injured in a Texas car accident caused by driver fatigue, or if you have lost a loved one as a result of a drowsy driver’s carelessness, you could be entitled to compensation for your injuries or loss. A Houston car accident attorney at the Law Office of Kevin Krist can help you to get the evidence you need in your case to show that the other driver was negligent and injured you as a result.